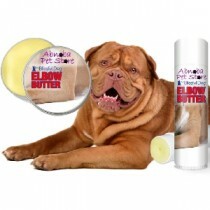 The purpose of ELBOW BUTTER is to smooth, soften and help the callus be less restrictive and tight for your dog. While ELBOW BUTTER is fabulous, it is NOT intended to remove the callus. Even if it DID, your dog would recreate that ugly callus every time he flops back down on the patio or ground. Big dogs are especially prone to those; Mastiffs, Newfoundland Dogs, Labs, Great Danes, Neopolitan Mastiffs, Leonbergers, Bullmastiffs, and others. Dogue de Bordeaux’s also seem to be prone to them. As our dog friends get older they are even more prone to dog elbow calluses and pressure sores. Read this post for more on Dog Elbow Calluses. Great for older dogs also. Much like us, they spend less and less time running and playing and more time searching out a comfy spot to recline on. Dog Elbow Calluses Be Gone! Of course, you should not shave or cut the calluses off. I know people do that on their corms and calluses, but it not the same for dogs. Don’t even think about it! I wonder if those little flesh eating fish would eat calluses? Note: Of course, please seek veterinarian care if your dog’s calluses are fluid-filled, draining, etc. Did You Know? Many exclusive spas and nail salons for people tout the efficacy of Chamomile tea soaks for ridding human feet of calluses. Chamomile has been proved to help soften and soothe the ravages of calluses on our feet and those same healing properties work just as effectively on our dog friends.